T-shirt artwork configuration: Front three quarter view of a beautiful 1955 Chevrolet two door Belair in all its chromed and polished glory. Brilliant imagery here folks, particularly as the paint work on this ’55 reflects the hot, bright flame work from the back ground. Not too many Tee’s getting around with a 1955 shoebox Chevy on it! Grab yours today, before this collectible image becomes obsolete! 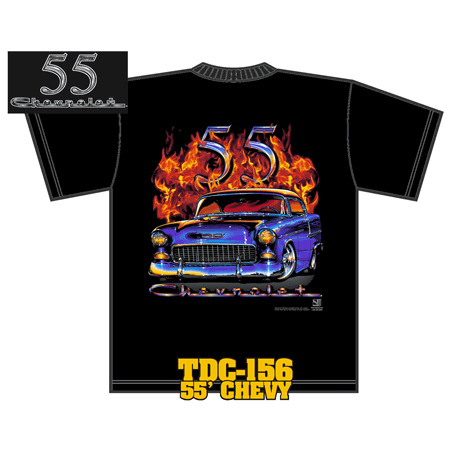 This Tee has the scripts “Chevrolet” in original fifties style badge emblem script style as shown at the bottom of the large image, with the script ‘55’ at the top of the image, reflecting the colours of the flames. 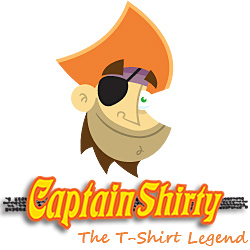 The script on the font left side of the chest is in Black and White, ’55 Chevrolet’. This product is officially GM licensed. A very collectable piece for any fifties Chevrolet collector and enthusiast of the shoebox era!